Skipper David Gray's fifth goal of the season earned Hibs a third successive Premiership win but it was a far from convincing performance from the Capital side who would have been happy just to have taken all three points. 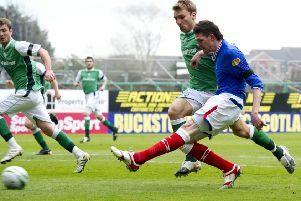 The game's decisive moment came in the 13th minute, Gray's head meeting Stevie Mallan's deep coirner but the Easter Road outfit were unable to capitalise on that lead as Saints clawed their way back into the match without being able to find what would have been a precious equaliser given their predicament at the foot of the table. Hibs were missing Paul Hanlon (dead legf) and the in-demand Martin Boyle (bruised foot), as Ghana internationalist Thomas Agyepong made his first start for the Easter Road club. It didn't take the Capital side long to get themselves in front against the struggling Buddies, former Saints midfielder Mallan's deep corner finding Gray with enough space at the back post to send a header down into the turf, the ball rearing up high into Craig Samson's net. Hibs had taken a strong grip of the opening half-hour but St Mirren stuck doggedly to the task and an Agyepong foul on Ryan Flynn allowed Cammy MacPherson to swing in an inviting cross which found no takers - a warning, however, to Neil Lennon's players although the little Ghana internationalist almost made amends for that unnecessary challenge by sending a low shot inches wide of Samson's left hand post. For all they had been decidedly second best, the Paisley side should have been level in the 33rd minute, Cammy Smith's pass finding Paul McGinn all alone and with only Hibs goalkeeper Adam Bogdan to beat but he succeeded only in sending his shot high over the target. Gray almost added his second of the game as Hibs tried to re-assert that early dominance, the full back venturing forward to take Emerson Hyndman's pass to fire in an angled shot which Samson beat round the post. Daryl Horgan had a glorious chance to double Hibs lead a minute before the interval when Flo Kamberi's attempt from Gray's cross broke off a St |Mirren pllayer and into his path but he sent his header straight into the grateful arms of Samson. Hyndman tested Samson with a low shot immediately after the restart before Anton Ferdinand threw himself in front of a powerful effort from Agyepong but, once again, Saints could have been level, new boy Simeon Jackson getting past Efe Ambrose only to see the legs of goalkeeper Adam Bogdan keep him out. New Saints boss Oran Kearney, however, would have been happy with the way in which his side had brought themselves back into the game, robbing Hibs of much of their earlier fluency in what had developed into something of dour battle with Lennon becoming increasingly exasperated on the touchline. Lennon would also have been furious at the number of needless free-kicks surrendered by his side, particularly around their own penalty area, the head of Ambrose coming to their rescue time after time. Hibs had ridden their luck on a couple of occasions and they did so again when Saints captain Stephen McGinn's long ball found MacPherson stealing in behind Lewis Stevenson. His shot beat Bogdan but crept past the far post by a matter of inches. St Mirren: Samson, P McGinn, Baird, Ferdinand, Hodson, Flynn, S McGinn, Edwards, Macpherson, Smith,(Jamieson 77) Jackson. /Substitutes: Lyness, Heaton, Kirkpatrick, McShane, Willock, Erhanon. Hibs: Bogdan, Gray (Whittaker 63), Ambrose, Porteous, Stevenson, Milligan, Agyepong (Slivka 84), Mallan, Hyndman (Shaw 63), Horgan, Kamberi.